This Woman isn't just the title of her new album; it is also the appropriate designation for the entrancingly beautiful, mega-talented LeAnn Rimes. It has been nearly a decade since Rimes became the youngest performer in country music history to debut at number one on the charts. Right before our eyes, the little girl with the big voice has grown up, and into her voice, in the most captivating way. On this album, Rimes clearly demonstrates that she is a consummate professional; highly polished and precisely refined. Despite the fact that country purists accused her of being disloyal to the genre that "made her," I believe that she has always known exactly where her roots were firmly planted and this album is absolute proof that This Woman has a country soul. Personally, I never saw Rimes as selling out to the pop genre but more as recruiting for the country genre. There is enough diversity on the new album for that trend to continue. Rimes had a hand in co-writing on three of the cuts on this album, including the sultry declaration to a broken heart, "When This Woman Loves a Man." She takes full advantage of this lament to show off her impressive vocal range. She also co-wrote on "You Take Me Home" which is sure to be a stroll down memory lane for a lot of people like myself, who got "a rush catching lightning bugs in a mason jar" and learned to dance "on daddy's feet." I also fully understood the line (in reference to L.A.), "If there's one thing by now I'd better know, the grass ain't greener where it doesn't grow." And all this wisdom is delivered via palatable, up-tempo, boot scootin' music accompanied by some cool harmony. 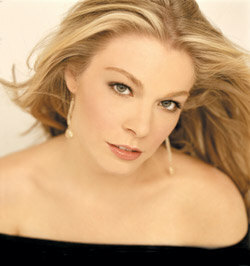 From the first drum beat of "I Want to With You," with it's catchy rhythm and great bridge, to the last chord of the twelfth and final cut of the bluesy "Some People," Rimes offers up an eclectic selection of songs and delivers them with a passion and understanding indicative of the woman she now is. Her maturity is highly visible in her beauty and her voice. Anyone who doubts that the little girl is now all grown up hasn't seen her lately; nor are they listening to This Woman.